“Beppu Onsen Hot Springs Resort” in Oita Prefecture, with various “Japan’s best” titles. The steam rising from everywhere in the city is the scenery unique to Beppu Onsen boasting the number of source and the amount of springs in Japan, and abundant spring quality. In Beppu city also called “the city of Hot Springs”, many hot springs are sprinkling around the two volcanoes of Tsurumidake and Garandake. This is a hot spring resort that is representative of Japan where more than 8 million tourists visit every year. Beppu Onsen is the 2nd largest source of spillage. 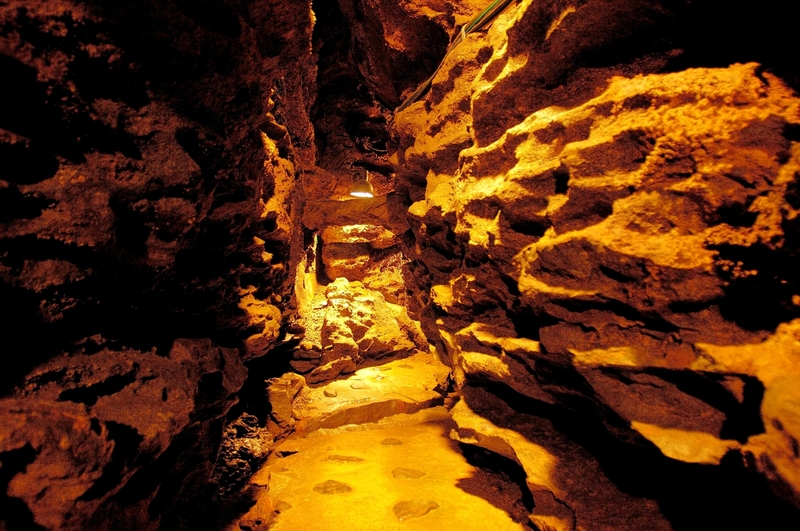 “Beppu Jigoku Meguri” (Beppu Hell Tour) consisting of seven sources with different spring quality and “Yukemuri Observatory” where you can see “Steamvapor of Beppu” are famous. In addition, the municipal hot sand bath in the corner of Shoningahama Beach next to Beppu Tourist Port is also popular. There you can take a bath of more than 10 people at a time and you can enjoy it in groups. There is a hot sand bath with a width of 6 meters and a length of 20 meters along the coast, if you linger in a sand and wear a yukata, you can have sand on your body for the clerk. You can warm your body while watching the ocean, you can refresh your body and mind. The origin of the name “Sea Hell” seems to be because the vast pond made by the explosion of Tsurumidake about 1,300 years ago seemed to be the color of the sea. 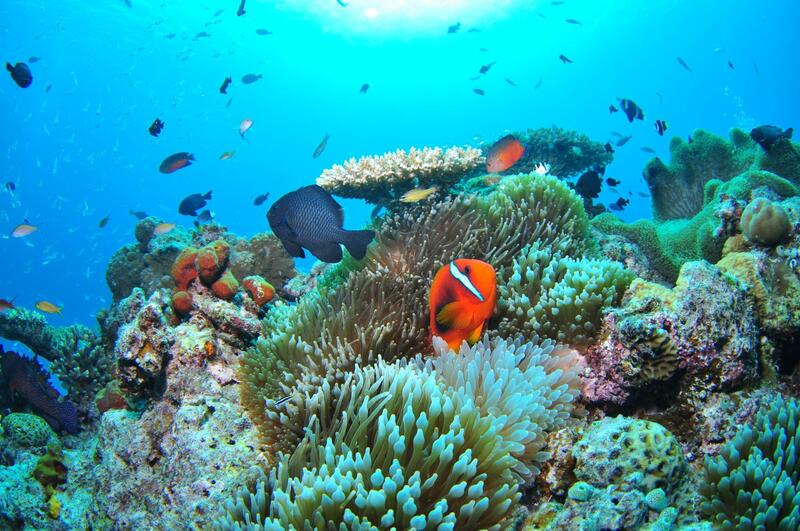 It is the largest in “Beppu Hell” and features shades of vivid and beautiful cobalt blue, which is unlikely natural. It seems that it turns to blue due to dissolution of iron sulfate which is a component in the hot spring, it is heat enough to make eggs at 98 degrees Celsius. In “Kamado hell” which is one of “Beppu Jigoku Meguri”, 90 degrees hot water springs with fumarold. Spitting hot sludge is exactly the hell itself. There are also strange hells (ponds) where colors change suddenly several times a year, and colors such as blue and green become thicker or thinner. Drinking hot springs and hot springs effective for hands, feet, throats, skin, and three kinds of footbaths are also provided. Among the seven “hell”, the four hell of “Sea Hell”, “Oni Ishi Bouzu Hell”, “Blood Pond Hell”, “Kamado Hell” are complete with “Footbath”. 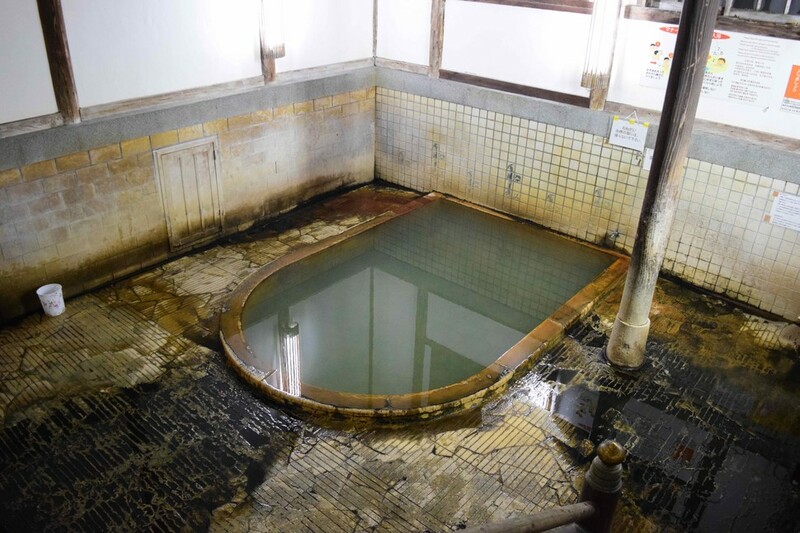 During “Beppu Jigoku Meguri” you can refresh with footbath. 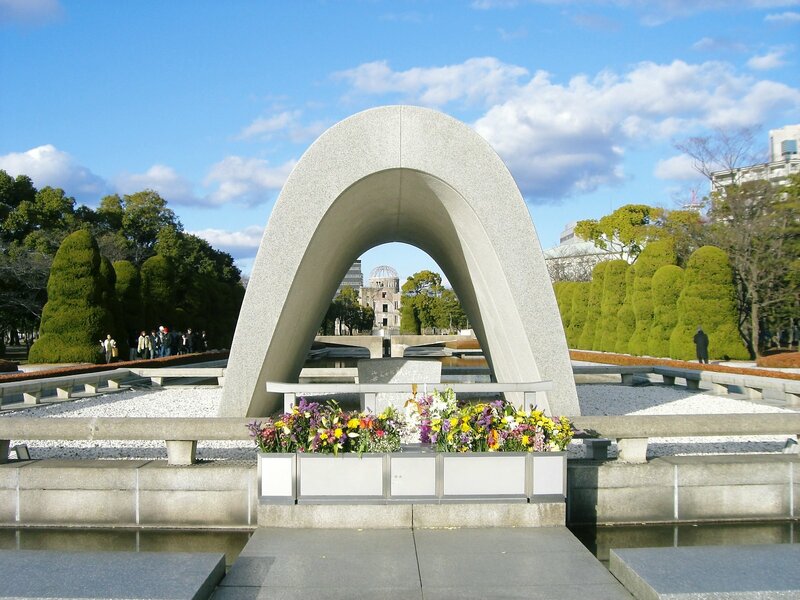 Therefore, even when the same term of Beppu was used, making it impossible to make sweeping generalizations. 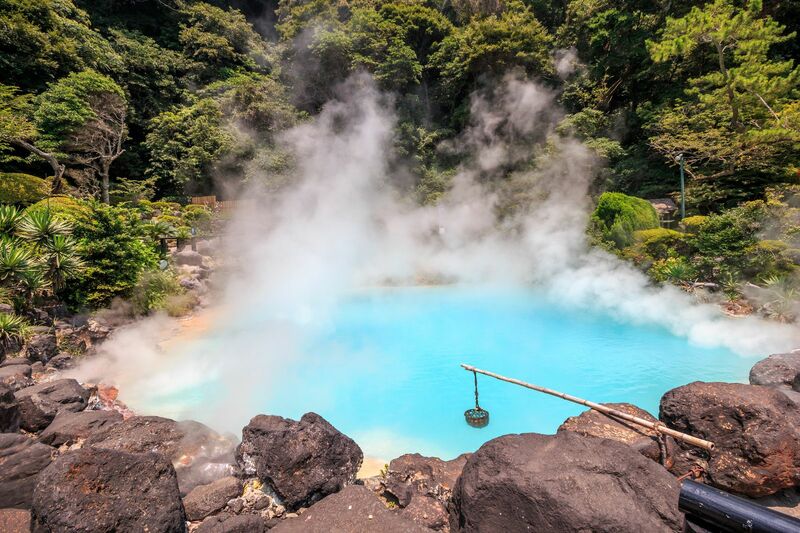 It consists of eight hot-springs resorts called the “Eight Springs of Beppu”, because there is the approximately 2300 location of a origin of hot spring. The “Eight Springs of Beppu” is eight places of “Hamawaki Onsen” “Beppu Onsen” “Kamegawa Onsen” “Kankaiji Onsen” “Horita Onsen” “Myoban Onsen” “Kannawa Onsen” “Shibaseki Onsen”. 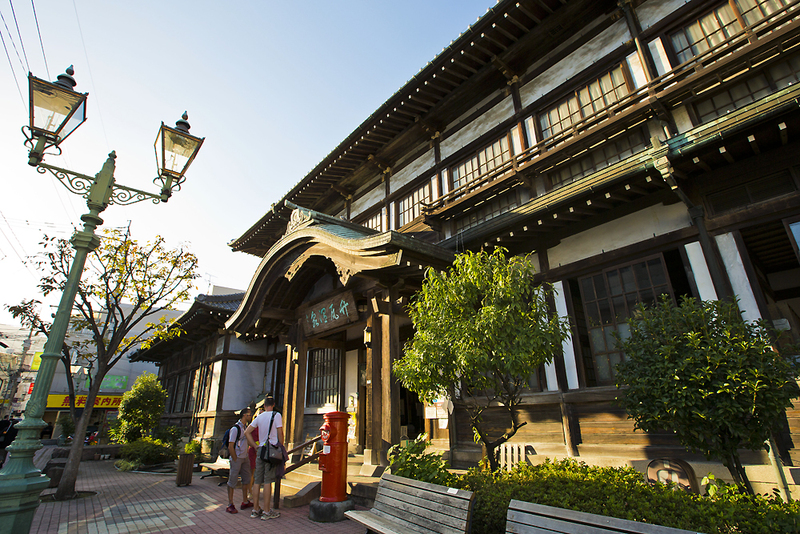 The representative hot spring of the “Eight Springs of Beppu” is “Takegawara-onsen Hot Spring” which can go in on foot about 10 minutes from Beppu Station. The good point of Beppu Hot Spring is being able to take a bath with the budget prices of 100 yen at almost all hot springs. And it is “using the spring water only once” which has hardly disinfected. 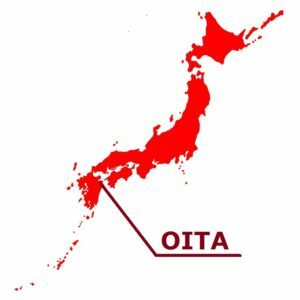 Of course the “Takegawara-onsen Hot Spring” is no exception to this rule, too. Hot water of the Takegawara hot spring tinged with the green is rather hot slightly. 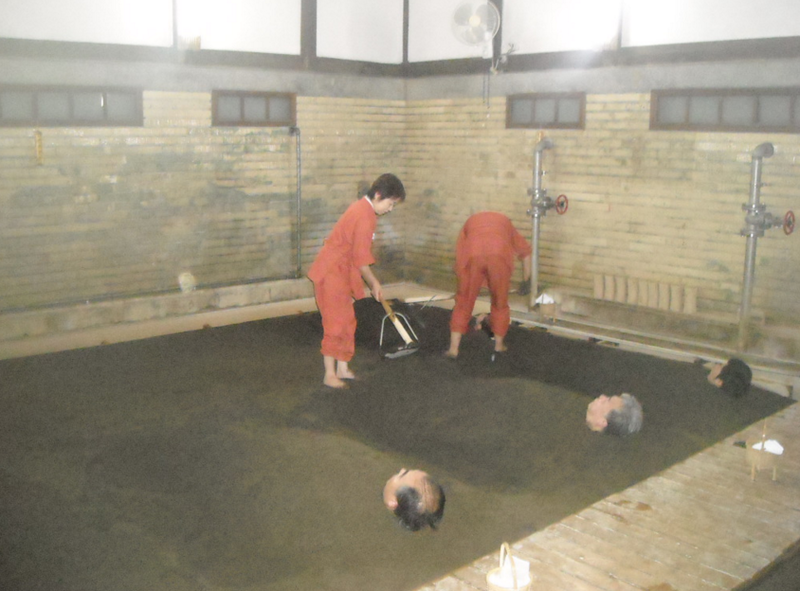 If you do “Kakeyu” (pouring beating hot water on body) firmly before being soaked in hot water, the body will get used and it will become easy to enter. If you are freely made tepid with water, you may be scolded by local people, so please be sure to check in advance. Because soap is not had always ready in most hot springs, let’s bring it, if necessary. The spring quality is different from the men’s bath and the ladies’ bath. And that is something extremely rare. Moreover, sand bath, such a find is rare in Japan, can be experienced if another charge is paid. Throwing sand on your body, but this is considerably heavy. In the “Takegawara-onsen Hot Spring,” because the sand is warmed with hot water, so it is very clean. Please try it by all means if interested.